Trump. SMH, Donald Trump. Donald T. Don T. Don’t! Don’t do it! He puts the D in debacle. I’ll get to him later. 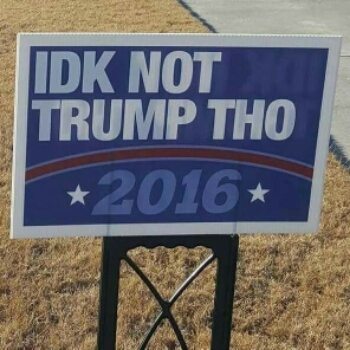 I’m not here to tell y’all who to vote for, nor to discuss my political preference, but to share my thoughts on the debacle that is the 2016 presidential election. Remember the last time a celebrity ran for office? 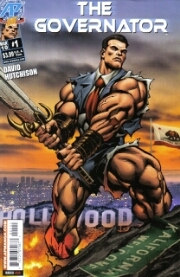 Arnold Schwarzenegger was elected as governor of California. It wasn’t horrible, nor was it great, but that was just a state. Because he was the Last Action Hero, people most likely associated his on-screen heroism as his real-life persona. That ain’t the smartest thing in a political arena, but I get it. Ah’nuld will save California like he did in the movies, right?! We survived and are continuing to survive, so oh well. an American hero – more like an anti-hero.. And if y’all haven’t caught on to the recent trend, we as a society dig the rebels, the drama queens and kings, the d-bags and the villains. For example, movies and TV shows are praising the bad guys, like Deadpool, Gotham: Rise of the Villains, Suicide Squad, Lucifer, Wreck-It Ralph, to name a few. And D-Trump is taking advantage of that whether he knows it or not. And the sheeple of America are jumping on the runaway bandwagon of hate off the cliff of despair into an ocean of trouble instead of a progressive pathway to peace and prosperity. Because Drumpf was once a reality TV sensation on The Apprentice, people actually liked him for entertainment purposes. In fact, that show was pretty koo, I admit. But now, in my book, he has lost all my respect and trust with his vile-fueled words and ignorant attitude. I’m sure y’all heard that Frump rallies are filled with racism and unruly behavior. When I hear about these things, I’m thinking that these are just ridiculous scenes straight out of a reality show. Jerry, Jerry, Jerry! This is the problem: Society is blurring the lines between fiction and reality. The presidential election is not a reality show! It can affect our lives and it shouldn’t be taken lightly. What’s really scary is that the tactics that Trumph is taking with firing up the crowd by saying whatever and condoning pure hate is beyond belief. I’m sure he knows what gets ratings – and apparently, votes – and he’s playing it to the T. I pray to God that these so-called Christians and DT supporters see past the shenanigans and realize that the next president shouldn’t be based on drama and blanket statements, but a unity within the nation, and even the world. There’s too much hate in this world as it is. We need to not fight, but unite! Do you want this as your future? With the election of Barack Obama, our country has stepped forward. If Grump gets elected as the new POTUS, that’ll be two, maybe even four steps back.. How can hate and ignorance make America great again? I’m really curious to know. Watching all these videos of violence at his rallies reminds me of the Civil Rights Movement decades ago. 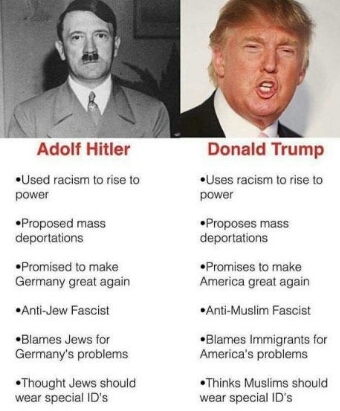 *scratching head* Is history repeating itself? I’m not talking about in terms of the cause, but just in racial tension. People need to snap out of the political brainwashing and do the right thing. I know what must be done. Do y’all know? Do we want another Holocaust? 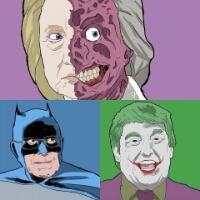 It’s a terrifying thing that people are comparing Donald Chump to infamous figures – real and fictional – such as Hitler, President Snow from the Hunger Games, and even the Joker…all lunatics in their own ways. If people are actually standing behind this maniac, does that mean his supporters have all gone mad? Or could it be that Donald Drunk is triggering people’s primal urges with his despicable framing techniques (using words that conjure thoughts or imagery) just to get the vote? Either way, we must stop this lunacy. With President Joker, the ultimate joke can be on us.